"It can be dangerous to be a feminist in prison," said Richard Reseda. Richard Edmond Vargas, also known as "Richie Reseda" is a convicted felon who has been serving time in an all-male prison in Soledad, California, for armed robbery since he was a teen. 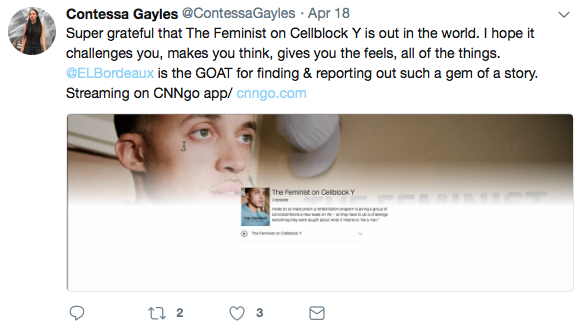 "The Feminist on Cellblock Y," a documentary produced by filmmaker Contessa Gayles, follows the now 25-year-old Reseda and his fellow prison mates as they participate in an inmate rehabilitation program centered around feminist literature. It's said in the documentary, "a lot of them come out even worse than they were before," referring to the inmates. In order to counter that particular manifestation, these men spend their days learning about the patriarchy, discovering the power of vulnerability, and personally combating toxic masculinity. Additionally, the program encourages the men to confront all of the areas where these toxic ideals of masculinity have prevailed in their lives. "We cannot challenge our harmful behavior without challenging patriarchy," Reseda says in the film. Reseda is the mentee of Black Live Matter co-founder and activist Patrisse Cullors. The two crossed paths during his high school years when Cullors was his school counselor. She has continued to support him and his program since he's been incarcerated. She also mentioned him in her book, "When they Call You A Terrorist". "This documentary is about a human being who wasn’t given up on. This is what transformative justice looks like," Cullors recently wrote in a poignant Facebook post about the documentary. "This is why I believe not just in the politics of abolition, but the practice. The hard messy sometimes disappointing but always rewarding work of abolition." Watch the trailer here. The documentary is available to stream on CNNgo.